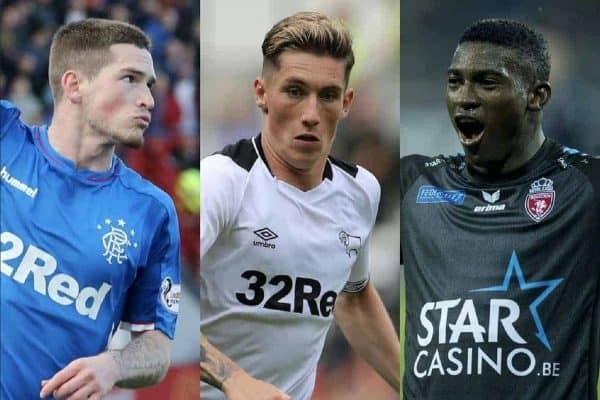 There will be a host of reunions for Liverpool’s loanees over the weekend, with Ryan Kent and Harry Wilson the two to watch of 13 potentially in action. The Reds take on Bournemouth at Anfield on Saturday, looking to restore their form in the Premier League after two draining 1-1 draws. Nathaniel Clyne is ineligible for the Cherries due to the terms of his loan agreement, while Danny Ings will also miss Southampton‘s home clash with Cardiff after a hamstring injury ruled him out for up to three weeks. Allan Rodrigues is currently in Rio de Janeiro ahead of a proposed switch from Eintracht Frankfurt to Fluminense, but beyond those three the majority of Liverpool’s loanees will take to the field. One of the most interesting matchups of the weekend sees two young Reds face off against each other, with Liam Millar’s Kilmarnock hosting Kent’s Rangers in the Scottish Cup. Millar made his second consecutive substitute appearance for Killie in the midweek 2-2 draw at Dundee, but has a good chance of starting on Saturday night, in what would be his first-ever start at senior club level. He can take inspiration from Kent, who is taking his chance under Steven Gerrard after a frustrating campaign of loans, with the Liverpool legend praising him for “taking the league by storm” since moving to the Scottish Premiership. In the Championship, Wilson should line up against a former club on Saturday as Derby host Hull City in a clash that could see them push into the playoff places. Wilson caught the eye in sensational fashion in the second half of last season at the KC Stadium, scoring seven and assisting four in 14 games for the Tigers. And it surprised some that he didn’t come into Jurgen Klopp‘s first-team squad for the current campaign. 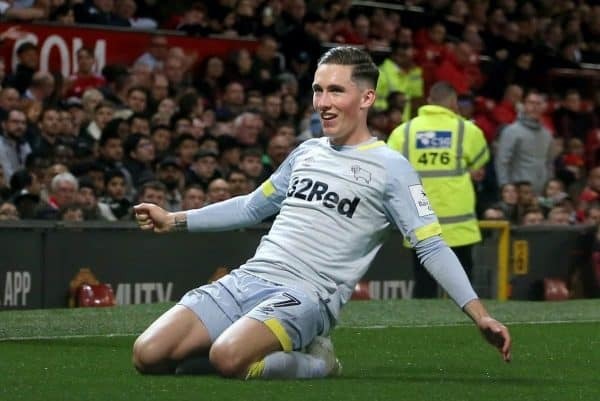 Instead, he joined Derby and has now netted 12 and laid on four in 28 games for the promotion chasers, with Frank Lampard explaining why he “loves having him in the squad” in Richard Jolly’s excellent column for This is Anfield this week. The strides that Wilson has made over the past 12 months makes it remarkable that he wasn’t even Hull’s first-choice target at the start of 2017, but now he could damage their own playoff hopes with another strong display on Pride Park. 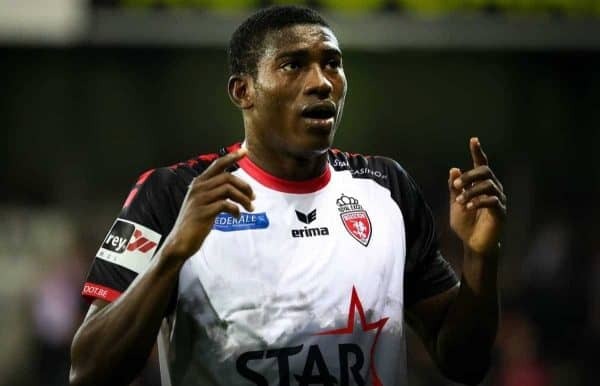 Finally, with Taiwo Awoniyi returning to Royal Excel Mouscron and serving a reminder to supporters with two match-winning goals in his first two games back, the Nigerian can look to prove himself against the side who barely gave him a chance. Mouscron travel to KAA Gent on Sunday evening, with Awoniyi having spent a disappointing half-season at the Ghelamco Arena that saw him score just three times in 22 games. The arrival of new boss Jess Thorup in October left the 21-year-old out of favour, playing 152 minutes over nine games for the Dane, but after returning to form immediately on moving back to Mouscron it is clear he is a striker of real talent. 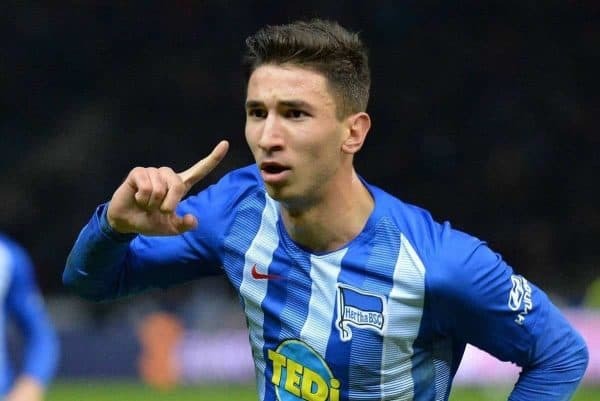 Elsewhere this weekend, Marko Grujic faces another test in the Bundesliga as Hertha Berlin visit Borussia Monchengladbach and Kamil Grabara could make his Danish Superliga debut as AGF Aarhus host Esbjerg. Pedro Chirivella could make his debut for Extremadura UD, in a home clash with Rayo Majadahonda on Saturday evening.